American Thanksgiving, or the quarter mark of the NHL season, is usually considered the time most teams take stock in what they have and look to make trades. This year has been no different, with a series of medium sized moves having already been made. Reports suggest the trade market is "ramping up significantly" in recent weeks, with several "dynasty" teams like the Blackhawks, Kings and Penguins looking to shake things up. And it's also clear the Ducks, Hurricanes, Blue Jackets and Oilers are trying to make things happen as well. Columbus' conundrum with pending UFAs Sergei Bobrovsky and Artemi Panarin deepens as the team keeps winning. 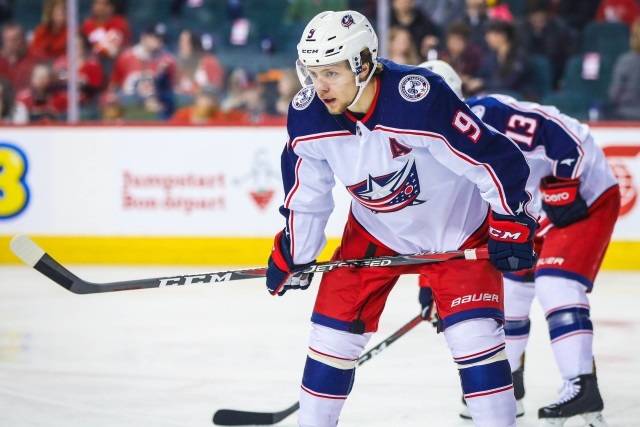 According to reports, Panarin has now started warming up to the idea of staying in Columbus - but at a steep price. It was previously believed he was dead-set on moving to a big market team like the Rangers or Kings. On the other hand, Bobrovsky seems unchanged in his plan to explore the free agent market in 2019. That leaves Columbus with a very difficult decision come this trade deadline - use their franchise netminder as a rental, or see what assets they can recoup on the market? Would the Sabres put Jeff Skinner on the rental market at the trade deadline? Reports indicate the team hasn't fully committed to the idea of extending the scoring winger who would likely command top dollars on the open market. Since the Sabres are still emerging from a long rebuild, the logic goes, they might see what they can get in a trade. I don't know if it makes sense to punish fans more than the organization already has - if I'm Buffalo I'm using Skinner as an own-rental and worry about an extension later.